For catching catfish, particular kinds of equipment are required. The most important and needed equipment is Catfish rod. But the question is which one is the best Catfish rod in the market right now? Finding the right catfish rod is not an easy task. The market is full of several kinds of fishing rods. Not all of them are ideal for catfishing. Catfishing rods need to be specific and strongly constructed. If you are not a professional angler, you might not purchase a better catfish rod. Why is that? The lack of knowledge and experience is the reason. But you can get the best one if you researched and learned about these rods. Master cat man John Jamison designed the Rippin Lips Super Cat Casting Rod which is considered as one of the best solutions for serious catfish hunters. It is one of the favorites among many anglers due to its construction and performance. The Rippin Lips Super Cat Casting Rod is Tourney angler’s number one choice as it has a beefed up blank, heavier stainless steel guides, and a fast tip. The length of the rod is about 7’6”which is the ideal length for catfishing and offer the maximum amount of control over fish. The rod is composite with a blend of E-glass, S-glass, and graphite. That means the Super Cat Casting Rod is durable and also lightweight. You can effectively catch large fish. To catch a monster catfish with ease, the Rippon Lips Super Cat Casting Rod has no exception. The medium-heavy action will serve you the power you need. The design is gorgeous and user-friendly with chrome-plated stainless steel guides. Overall, it is an excellent road at a great price. If you need to catch larger species, this is the right choice you can make. The Abu Garcia Catfish Commando Fishing Rod and Reel Combo are expensive than other top-rated roads in the market but it worth the extra price. The Abu Garcia is one of the most trusted fishing equipment manufacturers for decades. They have been providing quality products since their beginning. Catfish anglers all over the world respect this brand for their high-quality fishing equipment. 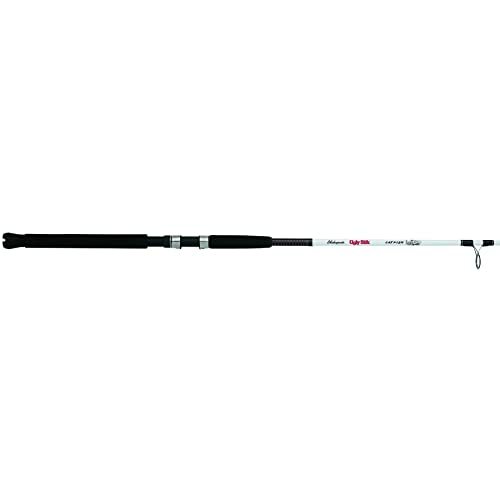 The Catfish Commando Fishing Rod is one of the examples of Abu Garcia’s excellent quality. The Reel that comes with the rod has two ball bearings, and a Carbon Matrix Drag system included. So, it can be reeled for big catfish with high efficiency and power. The unique and compact bent handle of the rod makes it easier and comfortable to use. As it features EVA handles and stainless steel guides, catfish anglers will be well-equipped with the Abu Garcia Catfish Commando Fishing Rod and Reel Combo. Like our first Rippin Lips products, this Rippin Lips Super Cat Casting Rod is also designed by master Cat angler John Jamison. Versatility is the most effective feature of this Rod. The rod has six different lengths available for catching different types of fish. The S-glass blank construction makes it stronger than most of the standard best catfish rods in the market. Surely, it will last and serve you several years without any problem. Though the rod is strong yet it is lightweight and easy to use. For smooth casting, the rod is developed with chrome-plated stainless steel guides and ceramic inserts. It is effective for night fishing as well with glow-in-the-dark tip. Also, the rod features split EVA grip handles to catch the toughest catfish with ease. If you are looking for a strong catfish rod, the Rippin Lips Super Cat Casting Rod is an excellent choice for the price. The Ugly Stik Catfish Casting Fishing Rod is a piece of Shakespeare’s Ugly Stik series, known for incredible toughness and durability. The name might feel a bit weird to you, but the performance it provides is fascinating. It works like a beast to catch the monster! That’s the reason most of the angler loves this particular rod. It is ideal for large catfishes. The Shakespeare’s Ugly Stik Catfish Casting Rod comes in two models. You can either pick a seven-foot version or an eight-foot version. The eight-foot version is constructed with a two-piece rod. On the other hand, the seven-foot is one piece. For the large catch, eight-foot version is recommended. The blank through handle construction of the rod offers stability as well as durability. Medium-heavy power of the rod makes it a great choice for long casting and catching big catfishes. The length of the rod is standard. Though it is tough therefore it is lightweight that makes it easier to use. Controlled accuracy is guaranteed. If you want to enter the catfishing universe, the Ugly Stik Catfish Casting Fishing Rod is the right choice you can make. Like all the other Rippin Lips products this one is also designed by famous Catman John Jamison. The construction quality of the Rippin Lips Super Cat Spinning Rod is incredible with the blend of E-glass, S-glass, and graphite. Durability is not an issue for this rod also it is pretty lightweight that makes it easier to use and carry. 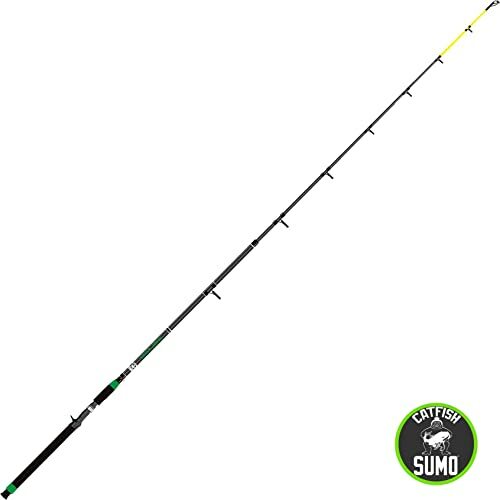 The Super Cat 7’6 inch medium heavy action rod is designed for the serious hunters. The beefed-up blank, stainless steel heavier guides and fast tip makes it the number one choice among the catfish anglers. The SuperCat custom EVA split grip offers correct balance to catch big fish while providing power for setting hooks and a comfortable under-arm fit. All guide wraps are epoxy coated that offers extra protection and toughness. The rod is ideal for fishing at night as well. 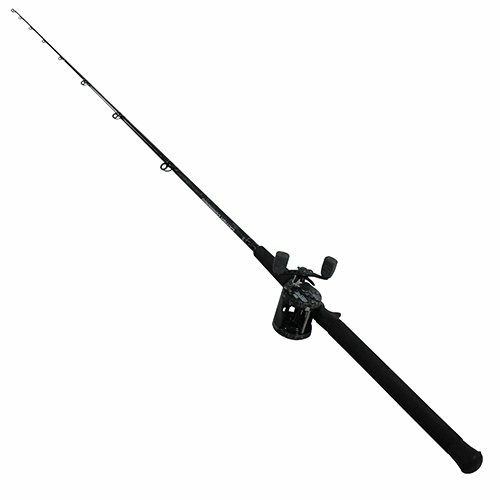 If you want a professional solution, then consider the OKUMA Battle Catfish Spinning Rod. It is designed for professional level anglers. 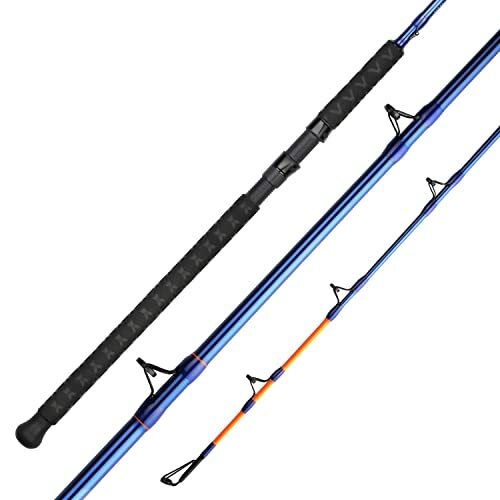 The rod comes with E-glass rod blank and double-footed stainless steel guides that provide confidence to catch the monster. The firm backbone of the rod offers unwavering power for reeling in large fish. The EVA grip and cork rear grip makes it comfortable and easier to control with perfect balance. If you are planning to catch tough catfish, the OKUMA Battle Spinning Rod is the right choice for you! Though it is a bit expensive, therefore the quality makes the price blur. For outstanding catfishing experience, OKUMA battle Cat rods can’t be wrong for you! What makes the KastKing Catfish Rod one of the leading options of the present time? Without any doubt the construction quality. The KastKat Catfish rods are made of S-glass materials. So, amazing strength and excellent lifting power are what it offers to the users. The rod is designed to handle large fishes. You will never fail while battling with a giant. A wide variety of sizes is available in the market for various types of trophies. But 7’6” is the most standard among all. The stainless steel double-foot guides with stainless rings will deliver uncompromising performance and durability. With comfortable Cross Wrapped EVA Handles you will never lose contact with the rod handle. You can use the rod all day long without having the discomfort of any kind. Furthermore, you will also get strong and secure reel seats made of reinforced nylon to hold large reels in the right place even if the pressure is extreme. If you need an excellent product for better trophies, this is the choice you need to make right now! The Shakespeare Ugly Stik Catfish Spinning Fishing Rod is another amazing one-piece option designed for catching large catfish. The construction quality with a virtually strong backbone is beyond the expectation of everyone. It is a sensitive and flexible graphite composite rod with durable stainless steel guides. The comfortable split EVA grips will give you the balance and control you always dream of. Your hand will never disconnect with the rod even when you are battling with a monster. The tip is also pretty effective. It glows in the dark. So, you can enjoy your night fishing too. 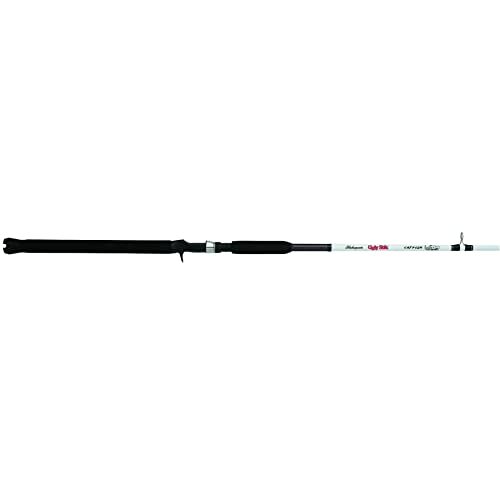 If you need a large rod with all the features, Shakespeare Ugly Stik Spinning Fishing Rod is what you need! With Graphite and S-Glass Construction, this KastKing New KatTech Catfish Rod is one of the strongest options in the market. 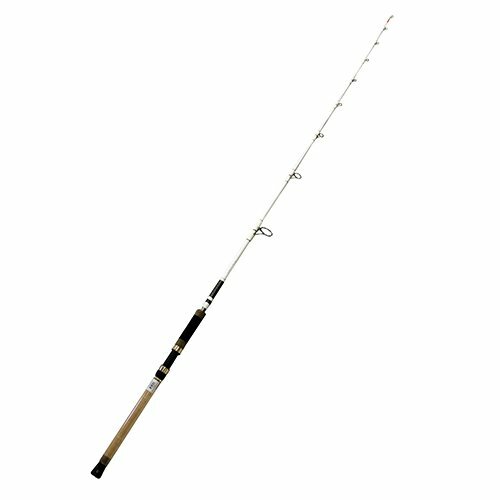 The rod is designed for tournament anglers who want to catch massive fish with ease. Though it is strong and powerful yet it is pretty lightweight. The manufacturer also used Fuji double footed MN guide frames with SiC rings so that it can handle extreme loads. The road is effective and easy to use in any condition. The handle of the rod is comfortable with rubber cork construction. It is slip-resistant, durable and easy to remove from the rod holders. As for better leverage, you will see foregrip on this rod. If you want to catch anything bigger like a champion, this is the rod for you! Hurry up; the stock is limited! 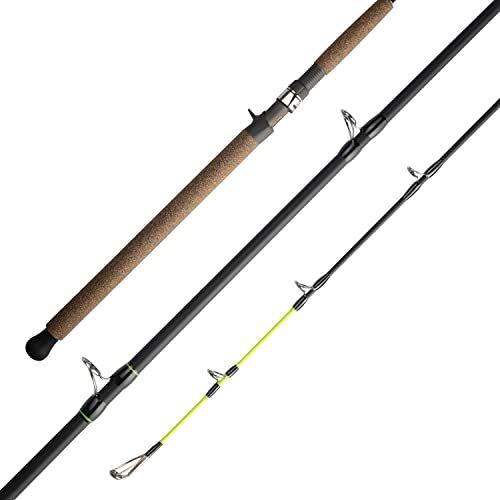 The Championship 2-piece, 7′ 6″ fiberglass rod is the last entry on our list of best catfish rod article but not the least! It is a medium-heavy rod comes with rugged construction. The rod can effectively fight and win against monster catfish. The double-footed stainless steel guides are low-profile and able to withstand the abrasion of thick braided lines. The Catfish Rod is rich with all the effective features. The grip of the rod is useful as well with EVA foam. It will provide you with better control and balance while catching fish. However glossy fiberglass finish makes it easier to rinse and wipe. The tip is visible even in the night. Night fishing will never be a problem. If you paired it with an effective reel, your combo would rock your way! The price of the product is not prohibitive. I am sure you will love to have it. That’s all for the best catfish rods we have for you. Now, you can never be sad for not finding the best one. We already provided and narrowed down the options for you. All of the products above are amazing regarding construction quality and for the performance. Professional anglers even recommend them. However, the prices of those products are not impractical. All of them are correctly priced. But everyone has their budget limit. Catch the one that meets all your requirements and fits your budget. Still, if you need to add some extra bucks for a better option, don’t miss it. A catfish rod is not something you will purchase now and then. It is an investment for several years. I am wrapping up now. If you have anything else to know, feel free to comment here. We will get back to you soon. We will catch you up soon with lots of other amazing product reviews, tips, and tricks.